It is vitally important that the West understands that Russia’s conduct in the Ukraine is a rational response to the strategic pressure that has been placed on the country by an encroaching military alliance, NATO. The Kremlin’s foreign policies conform to the expectations of defensive realism. A defensive realist foreign policy prioritises state security, which is maximised when a stable balance of power is established in the international system. Defensive realists advise against imperialism and aggression, but they do advocate power projection by threatened states to the extent that is necessary to restore the international system to a stable state of equilibrium. As Robert Person argues, Putin has been pursuing a defensive realist strategy because his, “ultimate objective is to maximize his security, not his power.” NATO’s hubristic expansion has destroyed the balance of power that existed in Europe during the Cold War and engendered feelings of insecurity and vulnerability in the minds of Russia’s leaders. These attitudes are rooted in a rational conception of the international as a realm in which the threat of war is constant and each state must take responsibility for its own survival. To say this is not to condone the Kremlin’s actions in Ukraine on an ethical level. But the righteous condemnations of Russia in the Western media have only served to obscure the origins of the Ukraine crisis and potential strategies for mediating it. If peace and stability are to be re-established in Eastern Europe, then it is vital that we look past the scaremongering and hyperbole, and re-examine the origins of Russia-NATO antagonism. NATO was founded in 1948 to balance the power of the USSR and its communist allies in Eastern Europe. The organisation’s founding members were the United States (US), Canada and ten Western European nations. Following the collapse of the Soviet Union in 1991, it seemed that the nascent Russian state would soon be integrated into the US-led world order. NATO appeared obsolete and some predicted that it would be disbanded. So how did we get to a situation where Russia and NATO are once again at loggerheads? To understand the re-emergence of NATO-Russia antipathy, we have to return to the final years of the Soviet Union and a meeting between Mikhail Gorbachev and then US Secretary of State, James Baker. On February 9, 1990 in the Kremlin’s St. Catherine’s Hall, Gorbachev made a stunning concession to Baker, agreeing to allow East Germany’s incorporation into NATO. The Soviet leader pledged to withdraw 380,000 troops from East Germany and approved the reunified, remilitarised Germany’s incorporation into a hostile military alliance. In return for his cooperation, Baker promised Gorbachev that, “there would be no extension of NATO’s jurisdiction for forces of NATO one inch to the east.” But by 1993, the Clinton administration had already embarked on plans to renege on Baker’s promise and extend NATO membership to Poland, Hungary, and the Czech Republic. Whilst Baker’s promise was not legally binding, NATO’s willingness to disregard Russia’s preferences and take advantage of the country’s weakness would set the tone for future interactions between the two entities. In 1994, Russia began trying to marginalise NATO by promoting the Commission on Security and Cooperation in Europe (CSCE) as the continent’s preeminent collective security body. Russia pushed for the deployment of CSCE peacekeepers within the post-Communist world and even allowed a CSCE force to be sent into Chechnya in 1995. Though these actions did to an extent empower the CSCE, the organisation soon became subordinated to NATO when addressing large-scale issues of European security. During the latter stages of the Bosnian War in 1994-5, NATO carried out airstrikes against Russia’s allies, the Serbs, in spite of Russian protestations. At the conclusion of the conflict, NATO insisted that it, rather than the UN, be charged with the implementation of the Dayton Accords. In 1999, NATO again intervened in Serbia, bombing the country for 78 days until Belgrade was forced to grant de facto independence to Kosovo. NATO’s war, which it dubiously justified as a humanitarian intervention, undoubtedly had much more to do with asserting the alliance’s preeminence in Eastern Europe than assisting Serbia’s oppressed Kosovar Albanian minority. NATO’s wanton use of force so close to Russia’s border alarmed the Kremlin, with Russia’s Foreign minister Igor Ivanov warning NATO’s actions risked ushering in a new Cold War. In 1999, the Czech Republic, Hungary, and Poland were also incorporated into NATO, as the alliance moved ahead with plans to admit the Baltic states of Latvia, Lithuania and Estonia. Whilst NATO has justified its expansion as a means for promoting freedom, democracy and human rights, the alliance’s enlargement had the effect of entrenching a formidable Western military presence in Central Europe. When Vladimir Putin came to power in January 2000, relations between Russia and NATO were at a very low ebb. Yet far from exhibiting any anti-Western tendencies, Putin initially attempted to facilitate rapprochement between Russia and the West. Putin characterised NATO as a minimal threat to Russia’s security, and even went as far as to suggest that Russia may still consider joining the alliance in the right circumstances. NATO responded with a conciliatory gesture of its own, establishing the NATO-Russia Council in November 2001. However, Putin’s overtures failed to dampen the alliance’s expansionist zeal. This was NATO’s most threatening and provocative move towards Russia yet. Ukraine, as the biggest country is Europe, constitutes an important strategic buffer between Russia and NATO. Napoleonic France, Wilhelmine Germany, and Nazi Germany all invaded Russia through southeastern Europe and consequently, the Kremlin is extremely reticent to allow the armies of those countries to once again be stationed there. Georgia borders Russia’s volatile Caucasus region, already rife with minority nationalism and secessionist sentiment. Furthermore, both Georgia and the Ukraine are proximate to Russia’s Volga region, its agricultural heartland and its access point for Caspian Sea oil. The Kremlin cannot and will not risk its control over these assets being compromised. It was only a matter of time before tension between Russia and NATO over the status of Georgia and the Ukraine spilled over into conflict. After winning wars of secession against Georgia in the early 1990s, the breakaway regions of Abkhazia and South Ossetia had enjoyed de facto independence from Tbilisi. Both had been reliant on Russia for strategic and financial support, though Russia still formally recognised them as part of Georgia. In May of 2008, when Georgian President Mikhail Saakashvili requested that Russian peacekeepers in Abkhazia be withdrawn and replaced by either EU or NATO forces, Russia responded by increasing the size of its force. In June, Georgia detained Russian peacekeepers stationed in Abkhazia. Then on August 7 Georgia launched an attack on South Ossetia, killing numerous civilians and 12 Russian soldiers. A day later, Russia sent ground troops into the secessionist territories and began bombing Georgian military and industrial targets. After five days of fighting, Moscow forced Tbilisi to agree to a ceasefire on Russian terms. Russia formally recognised the two breakaway polities as sovereign nations and announced that a force of 7,600 would remain in the territories indefinitely for their “protection”. Russia’s war succeeded, as NATO’s plans to extend membership to Georgia were put on an indefinite hold. The alliance could hardly incorporate Georgia when Tbilisi had no sovereignty over 20 percent of its territory. Nonetheless, the West continued to put geostrategic pressure on Russia. NATO suspended the Russia-NATO Council, established a permanent military presence in the Baltic and, in December 2009, refused a Russian proposal to replace the CFE treaty. In 2010 the US relocated a Patriot missile battery from Germany to Poland and, in 2012, opened phase one of its European Missile Defence Shield. With tensions high and the issue of Ukraine’s NATO membership still unresolved, another conflict always seemed likely. Ukrainian society is deeply divided between pro-Russian and pro-Western segments, and voting in the country tends to follow this division. The Westernisation of Ukraine had been stalled by the election of the pro-Russian Victor Yanukovich in 2010. On 25 November 2013, Yanukovich delayed his decision to sign an Association Agreement with the EU which would have forced the Ukraine to sever all economic ties with Russia. Instead, Yanukovich signed a deal with Russia whereby the Kremlin would buy $15 billion of Ukrainian bonds and cut its gas prices to the country by one third. This decision angered pro-Western Ukrainians, who took to the streets in protest. As civil unrest grew, police began to crack down violently on demonstrators. On the 21 February 2014, after three months of protests, Yanukovich fled to Russia and, in what can only be described as a coup, a new pro-Western government took power in Kiev. The full extent of US involvement in the coup is at this stage unknown, but a leaked conversation between US assistant secretary of state for European and Eurasian affairs Victoria Nuland and US Ambassador to the Ukraine Geoffrey Pyatt suggests it could have been substantial. During the conversation, Nuland expressed her support for regime change in Ukraine and her desire to see Arseniy Yatsenyuk become the country’s new Prime Minister – which he did. Russian troops moved into the Crimean Peninsular on 22 February. Putin chose to take Crimea primarily because it contains the strategically important Black Sea port of Sevastopol, which Russia had been leasing from the Ukraine since the end of the Cold War. The annexation of Crimea was a warning that Moscow would not tolerate the Ukraine slipping out of its orbit. 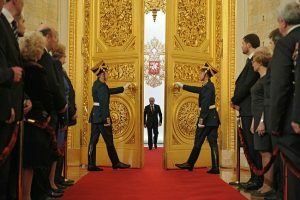 On the day of the Crimean annexation, Putin warned NATO not to “make itself at home in our backyard or in our historical territory.” Russia then orchestrated a proxy war in Eastern Ukraine, arming pro-Russian rebels and probably also deploying several hundred Special Forces soldiers in Eastern Ukraine to aid them. In May, Ukraine elected a pro-Western government that renounced the country’s non-aligned status and signaled its desire to join NATO. Russia’s militarist tactics were once again successful in stalling NATO’s advance. In March 2016, European Commission President Jean-Claude Juncker affirmed that the Ukraine would not gain NATO membership within the next two decades. However, since 2014, NATO and the Ukraine have conducted numerous joint military exercises and NATO has committed $5.4 million to assist with the modernisation of Ukraine’s army. The alliance has also increased its troop presence in the Baltic and conducted a military parade in Estonia less than a kilometer from Russian territory. In 2016, the US completed phase two of its missile defence shield, opening a weapons system in Romania and announcing that a similar system will be opened in Poland in 2018. Russia, meanwhile, has ensured that Eastern Ukraine remains in a state of frozen conflict and has effectively consolidated its control over South Ossetia and Abkhazia. With neither side having shown much interest in diplomacy so far, it is hard to know how much can be achieved through negotiation. But the dangers entailed by the current standoff are alarming. Russia and NATO control the overwhelming majority of the world’s nuclear weapons and whilst the likelihood of an all out war is low, this risk cannot be ignored. Russia and NATO are never going to see eye to eye on some issues, but tensions cannot be allowed to escalate any further. Western leaders are loathed to make any concessions to Russia, but peace can only be re-established in Eastern Europe through compromise. Waltz, Kenneth (1979) “Theory of International Politics”, Addison-Wesley, Reading. Zakaria, Fareed (1999) From Wealth to Power: The Unusual Origins of America’s World Role, Princeton University Press, Princeton. Person, Robert (2017) “Balance of threat: The Domestic Insecurity of Vladimir Putin”, in Journal of Eurasian Studies, Vol. 8, No. 1, pp. 49. Mearsheimer, John (1990) “Back to the Future – Instability in Europe After the Cold War”, in International Security, Vol. 15, No. 1, pp. 5. Asmus, Ronald (2002) Opening NATO’s Door: How the Alliance Remade Itself for a New Era, Columbia University Press: New York, pp. 5. Cohen, Roger “Yeltsin Opposes Expansion of NATO in Eastern Europe”, in The New York Times: New York, 02/10/1993. Accessed 25/10/2017. Ghebali, Victor-Yves (2005) “Growing Pains at the OSCE: The Rise and Fall of Russia’s Pan-European Expectations”, Cambridge Review of International Affairs, Vol. 18 No. 3, pp. 377. Donaldson, Robert & Nogee, Joseph (1998) The Foreign Policy of Russia: Changing Systems, Enduring Interests, M. E. Sharp, New York, pp. 207. Biddle, Stephen (2002) “The New Way of War? Debating the Kosovo Model”, in Foreign Affairs, Vol. 81, No. 3, pp. 140. Chomsky, Noam (1999) The New Military Humanism: Lessons from Kosovo, Pluto Press: London. Levitin, Oleg (2000) “Inside Moscow’s Kosovo Muddle”, Survival, Vol. 42, No. 1, pp. 136. Simon, Jeffrey & Spero, Joshua (2011) “Security Issues: NATO and Beyond” in Wolchik, Sharon & Curry, Jane eds. Central and East European Politics: From Communism to Democracy, Rowman & Littlefield, Plymouth, pp. 148. Gaddis, John (2005) Strategies of Containment, Oxford University Press, Oxford. Smith, Martin (2010) “NATO-Russia Relations: Will the Future Resemble the Past” in Aybet, G. & Moore, R.R. eds. NATO in Search of a Vision, Georgetown University Press, Washington DC, pp. 109. Tudoroiu, Theodor (2007) “Rose, Orange, and Tulip: The Failed Post-Soviet Revolutions”, in Communist and Post-Communist Studies, Vol. 40, No. 3, pp. 323. Tudoroiu, Theodor (2007) “Rose, Orange, and Tulip: The Failed Post-Soviet Revolutions”, in Communist and Post-Communist Studies, Vol. 40, No. 3, pp. 324. Lane, David (2008) “The Orange Revolution: ‘People’s Revolution’ or Revolutionary Coup?”, in The British Journal of Politics & International Relations, Vol. 10, No. 4, pp. 527. Gidadhubli, Raghavenbrarao (2004) “Expansion of NATO: Russia’s Dilemma”, in Economic and Political Weekly, Vol. 39, No. 19, pp. 1885. Pouliot, Vincent (2010) “International Security in Practice: The Politics of NATO-Russia Diplomacy”, in Cambridge University Press: New York, 222. Quoted in: Pouliot, Vincent (2010) “International Security in Practice: The Politics of NATO-Russia Diplomacy”, in Cambridge University Press: New York, pp. 222. Kay, Sean (2010) “Missile Defences and the European Security Dilemma”, in Aybet, G. & Moore, R.R. eds. NATO in Search of a Vision, Georgetown University Press: Washington DC, pp. 132. Kay, Sean (2010) “Missile Defences and the European Security Dilemma”, in Aybet, G. & Moore, R.R. eds. NATO in Search of a Vision, Georgetown University Press: Washington DC, pp. 144. Pouliot, Vincent (2010) International Security in Practice: The Politics of NATO-Russia Diplomacy, Cambridge University Press: New York, pp. 222. Offensive Realism”, European Security, Vol. 22, no. 1, pp. 78. Offensive Realism”, European Security, Vol. 22, no. 1, pp. 79. Antonenko, Oksana & Giegerich, Bastian (2009) “Rebooting NATO-Russia Relations”, in Survival, Vol. 51 No. 2, 14. Antonenko, Oksana & Giegerich, Bastian (2009) “Rebooting NATO-Russia Relations”, in Survival, Vol. 51 No. 2, pp. 15. Quoted in: Ratti, Luca (2013) “Resetting NATO-Russia Relations: A Realist Appraisal Two Decades after the USSR”, in Journal of Slavic Military Affairs, Vol. 26, No. 1, pp. 144. White, Stephen, McAllister, Ian & Feklyunina, Valentina (2010) “Belarus, Ukraine and Russia: East or West?” in The British Journal of Politics and International Relations, Vol. 12, No. 3, pp. 344 – 367. Ivhenko, T. (2013), “‘Don’t Beat Us – Love and Protect Us’”, in The Current Digest of the Russian Press, Vol. 65, No. 50, pp. 3. Ivhenko, T. (2014), “New Leaders in Kiev, Unrest in Crimea”, in The Current Digest of the Russian Press, Vol. 66, No. 9, pp. 3. Gorenburg, Dmitry (2010) “The Future of the Sevastopol Russian Navy Base”, in Russian Analytical Digest, Vol. 75, No. 10, pp. 11. Golts, Alexander (2014) “Russia Bound to win its Proxy War in Ukraine”, in The Current Digest of the Russian Press, Vol. 66, No. 19-20, pp. 3. Haynes, Michael (2003) “Counting Soviet Deaths in the Great Patriotic War: A Note”, in Europe-Asia Studies, Vol. 55, No. 2 pp. 308. Gilderhus, Mark (2006) “The Monroe Doctrine: Meanings and Implications”, in Presidential Studies Quarterly, Vol. 36, No. 1, pp. 5–16.